It is time again to post our entries in the Soap Challenge Club. 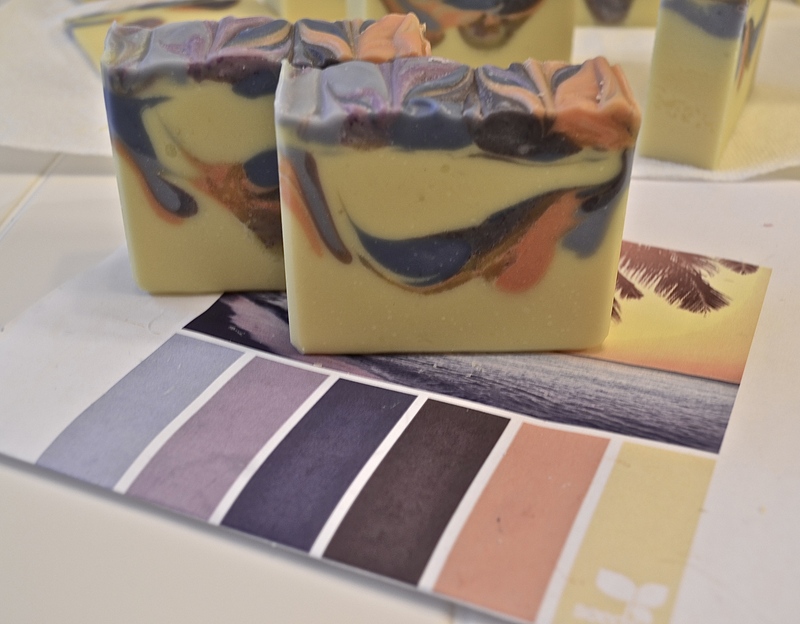 This month is different from past months in that we were not given a specific design to create, rather we were given two color pallets and the choice of using natural colorants or synthetic colors. 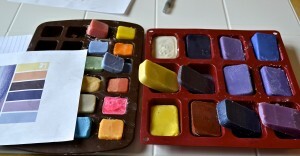 We also had the option of doing both pallets but it could not be combined into one soap, i.e., choose the pallet and choose the method of coloring. I love colorful soap and mostly use micas for my colorants. I do make several all natural soaps and primarily use clays for color in those. So my first choice was to go with synthetic colors using the Summer Setting pallet. I decided to test my colors first (actually I had some new micas I wanted to test also). So I made test batch of soap and went to work. 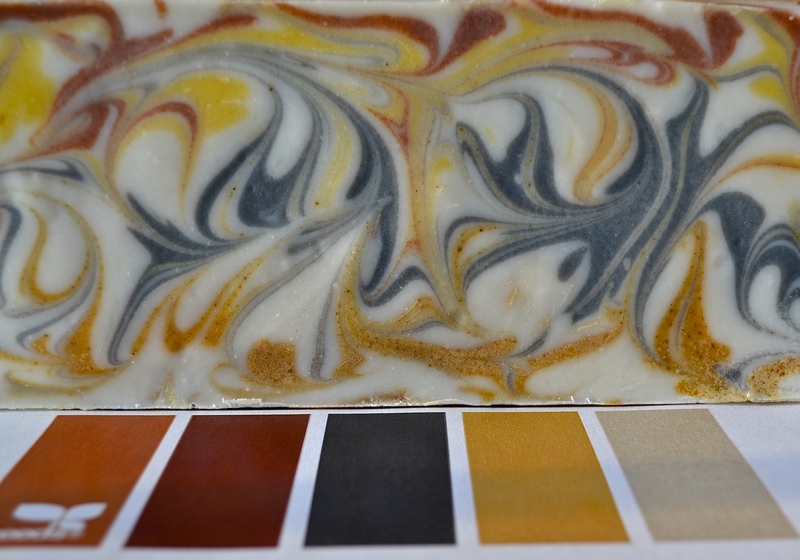 Here are some of the trays of test soap – they have the colors that I decided to use for the challenge. The recipe for the test batch was pretty boring so we used a different recipe but one that still produced a relatively white base and used Vetiver from Brambleberry as the fragrance. I don’t remember having problems with that one before. This time the soap moved faster than expected but was still somewhat workable. The problem was the colors. The blue was beautiful when I mixed it but it completely faded by the time I was finished pouring. And the yellow that I used for the base to pour the drop swirl turned bright orange. It was difficult to tell the difference between the orange and yellow. 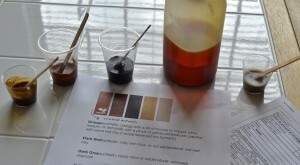 I was totally surprised because I had no problems with the test batch colors. I am not sure whether it was the heat from a larger batch or the fragrance. So what could I do but put the finished loaf under its blanket and let it become soap. The next morning I was of course anxious to see what my epic failure was going to look like. Surprise! The blue was back but not as dark and the yellow was yellow again. It turned out much better than I was expecting but because I was sure it was not going to work out I decided to do the Autumn pallet in natural colors. Again I used a recipe that would produce a white soap base. 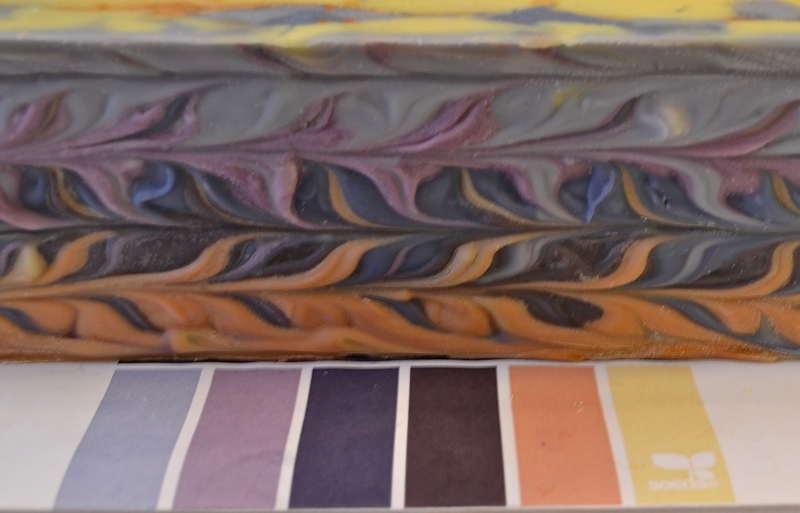 Since this soap was being colored with natural ingredients I decided to use essential oils as the fragrance and with the darker colors I thought it was a good time to bring out the patchouli and mixed it with sweet orange and bergamot (it smells great). I did not add the essential oil blend to the off white part. 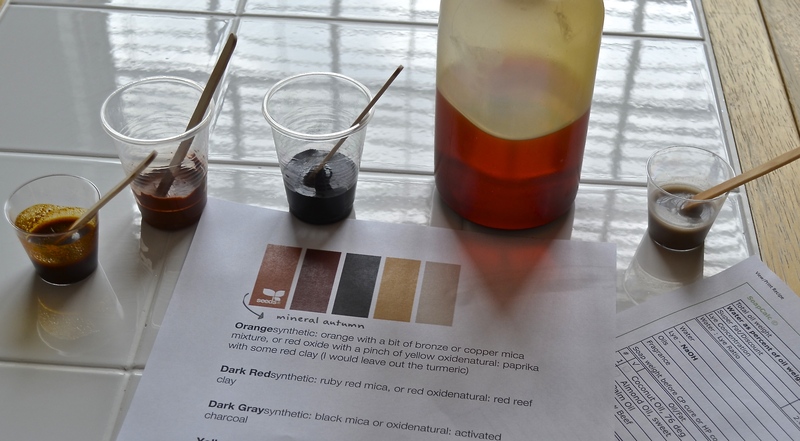 In the past I typically used only one or two natural colorants in a all natural line. 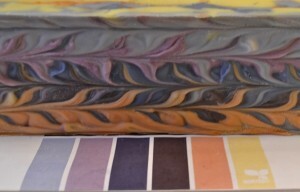 I am very happy that I decided to do both challenges because it has opened my eyes to the possibilities with natural colorants to create beautiful swirls. Thank you Amy for another fun challenge. The colors in both soaps came out beautifully. 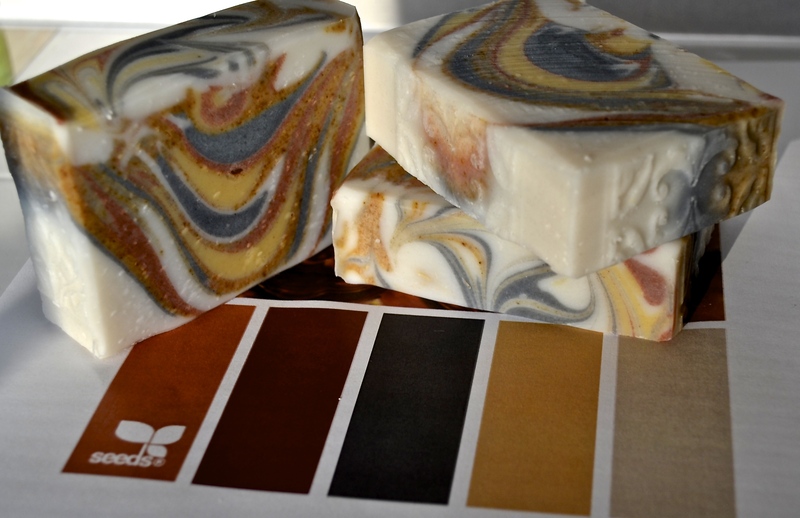 The drop swirl looks very elegant and the contrast of the colors in the Autumn color palette is great, too! I agree – both soaps turned out really beautifully! Beautiful colors! You do some lovely tops, too! Lovely! Especially the Summer palette! Both soaps are stunning! Awesome job!! !